I'm Richard Brooks. We're talking about one of my favorite metals today, stainless steel for countertops. Stainless steel is one of the most versatile metals we work in here at Brooks Custom. It's a metal that we can weld and polish out so that you can't find the seams. And we can really make it an unlimited size. We can make it soft looking. We can do integral sinks in it. Very versatile, very hygienic, very home owner friendly and easy to maintain. The truth is about stainless steel, that you can take a Scotch-Brite pad after 20 years and scour a stainless steel countertop, take all the minor scratches out of it, and make it look as good as the day it was new. It is truly stainless. We use14 gauge stainless, it's about a 16th of an inch thick. And we bend it down and back under. This gives a slight radius on the top corner and the bottom corner. We take the material, when we bend it, we weld our corners and we polish them out. Again, we could polish out stainless steel so you literally cannot find the welding marks. That's really the only metal that lends itself to this kind of polishing and craft work. What we do with stainless steel, most of us are used to the front of a refrigerator, or an appliance coming in stainless, and having a brushed finish. A brushed finish has a unidirectional brush. Everything is going in a straight line. You can see from this example going left to right. Now, for a countertop we normally would not do a unidirectional brush. We would mount a Scotch-Brite pad on the machine and create a brush that goes in all directions. It's called an omnidirectional brush. What that means is, when you get minor scratches in your countertop, you can take a Scotch-Brite pad and scour with it and randomly remove all the slight marks, and really make it look as good as the day it was new -- an omnidirectional brush. So, we take this 14 gauge material and we bond it to a substrate. It's water resistant, fiber core. It's bonded 100%, so it's got a solid feel. We put sound proofing on the back of sinks, to make everything feel solid. And we introduce a finish to it, so we have this unidirectional brush for a wall panel, omnidirectional brush for countertops. There are other finishes, however, in stainless steel. This example is of a machine ground, pattern ground stainless. This is done by a craftsman. Very often, designers come here and work with our craftsmen to develop patterns of grinding. You see these very often on sculptures outside of commercial buildings -- pattern ground stainless steel. It picks up the light from the sun, a very exciting look. We can sand blast stainless steel. This is etched stainless steel, or sandblasted. It still has a stainless quality -- very, very innovative next to normal stainless steel. We can also quilt stainless steel. If you've been to the diner on the highway, very often, you'll find quilted stainless steel patterns in the metalwork outside on the building of the diner. We can do this as back splashes. It's great for vertical applications. In addition to that, we have machine hammered stainless steel. This is done by machine; it makes it affordable. It is not hand done. It's possible to hand hammer stainless steel. It's very labor intensive. We don't recommend it. This is mirror polished stainless steel. You do see it on the inside of elevators and commercial buildings, but it's also great in residential applications around the fireplace, on a piece of furniture. We have occasionally done countertops in mirror polished stainless steel. And I would say there's the possibility of a maintenance issue with the use of it, however we are excited to use this. This is eighth-inch stainless steel. It's called 10 gauge. So, the thickness of that material lends it to doing no edge at all. Another form of stainless steel is patina'd stainless. This is something that's really new on the market. There are very few people in the United States patinating stainless steel to this degree of charcoal darkness, or light gray. This very innovative use of stainless, not for countertops applications, but great for furniture. There are many edge shapes available in stainless steel. This is a square edge, and this is available at any height of course. This is a marine no-drip edge; I'll show you the section of that. This is a dramatic version. So, another version of the marine no-drip edge, it sweeps back a little, keeps liquids in on a rolling ship. It's also used for lots of commercial applications. This one is of a very dramatic turn down in steel, a custom edge and we made it for a project. And here's another custom ended swept back bull nose, a very beautiful use of metal. We don't make complicated OGs and fancy, traditional edges in stainless. It really lends itself to a modern design idiom. It's got a clean look. It's an hygienic, good food prep surface. Great for fireplace mantels, furniture parts, wall panels, countertops, integral back splashes, sinks. Stainless steel is one of the most versatile metals. We can weld it into an almost uninterrupted length, and you would not be able to see a joint. Stainless steel adds a unique air to a project. You can combine it with wood, you can combine it with stone. And find a place on either side of a cooktop or on the fireplace with sides of stainless steel. It has a hint of modernity that makes your project really stand out. Brooks Custom creates luxury furniture and countertops from wood, metal, concrete and glass. Contact our expert design team for quality custom manufacture and delivery worldwide. 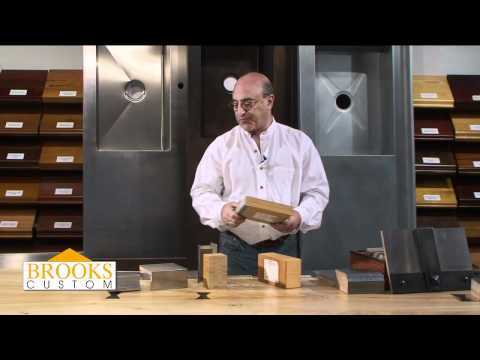 Stainless Steel Video Transcript: Custom Stainless Steel Countertops and More! This is mirror polished stainless steel. You do see it on the inside of elevators and commercial buildings, but it's also great in residential applications around the fireplace, on a piece of furniture. We have occasionally done countertops in mirror polished stainless steel. And I would say there's the possibility of a maintenance issue with the use of it, however we are excited to use this. This is eighth-inch stainless steel. It's called 10 gauge. So, the thickness of that material lends it to doing no edge at all.